In November 2014, Royal Caribbean Cruise Line's launched new ship, Quantum of the Seas. It is the third largest cruise ship in the world. We were on the Trans Atlantic Maiden Voyage in November. 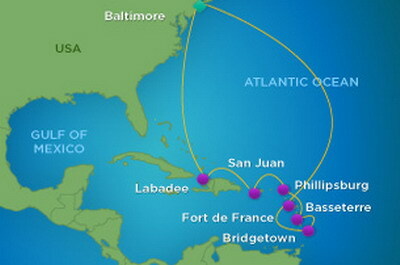 We are now on a 12-night cruise from Cape Liberty in New York to the Caribbean in January 2015. The cruise starts in Cape Liberty, New Jersey and we will visit Labadee in Haiti; San Juan in Puerto Rico; Philipsburg, St. Maarten; Fort de France in Martinique; Bridgetown in Barbados; Basseterre St. Kitts; and then back to Cape Liberty, New Jersey. A total of 12 nights.